I met Pepper through my critique partner, Dawn Crandall. Dawn had recommended Pepper's debut novel, The Thornbearer, and after reading the description I knew it was a book I'd want to snag. I'm kinda, maybe, just a little happy I did, too:) Here's the blurb, and we'll chat on the other side! I'm a lover of history, so the setting of this book captivated me. Pepper does an amazing job of putting the reader smack dab into the middle of The Lusitania, the city of Queenstown, and eventually a hospital/orphanage in a small European town. I enjoyed each character I met, including the secondaries. Sam and Ashleigh are an amazing pair. Having married my own best friend, I was immediately attached to this couple. I rooted for them from page one and loved watching their attraction move from friends to more. They had their own rough road to navigate, and Pepper authentically handled their struggles. The motivation surrounding their choices all made sense, and their character development was neither rushed or drawn out. The core message that God is more than enough for any situation and can heal even the deepest wounds is one that many will relate to. Add to all this, I simply enjoyed Pepper's voice as an author. Her characters' dialogue flowed easily as did their internals. Her descriptions were colorful but not overdone--she left more than enough for the reader to fill in with their own imagination, which I always enjoy. Working within this historical period and having her characters navigate many of the struggles that occurred during this time frame only deepened the plot and setting, snagging and keeping my interest. 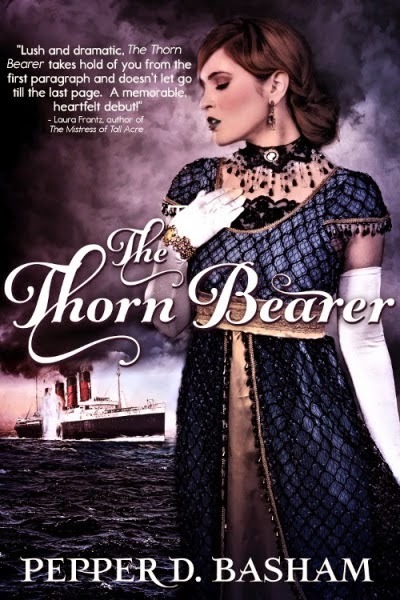 If you're looking for a book for this weekend, you can purchase The Thornbearer here. Oh this sounds like just the book I need!! I can't wait to read it!! You are amazing! I'm still in awe of this beautiful review!! Thank you so much. I'm glad you liked my voice - sweet words to my heart!